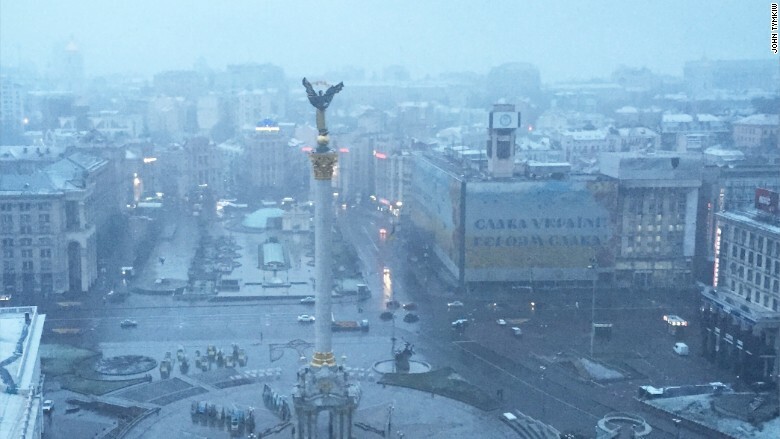 A year ago, Kiev's main square was overtaken by protesters. Kiev's mayor has two priorities when it comes to Ukraine's economic recovery: Wiping out corruption and attracting investors. "Almost one year ago, we saw a Kiev which was destroyed," said Mayor Vitaliy Klitschko, referring to last year's deadly pro-EU protests on Kiev's main square, or Maidan. Today, he added, "Kiev is safe. We have the situation under control. We just have an unstable situation in Donetsk and Luhansk." 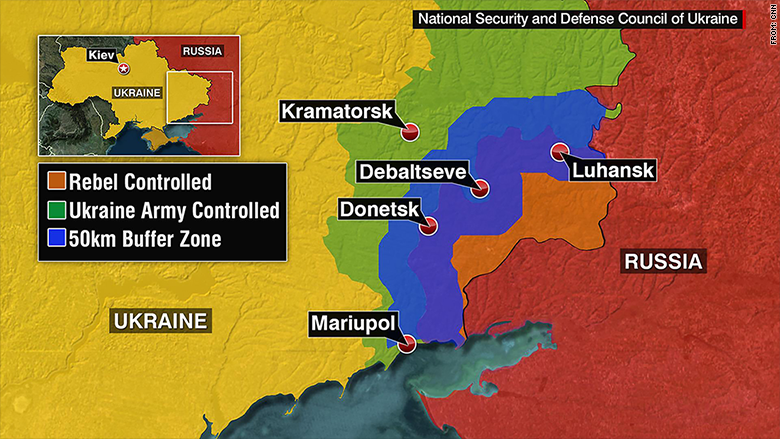 That "unstable situation" is nearly 500 miles to the east of Kiev, where fighting between Russian rebels and Ukrainians has not only hindered Ukraine's progress, it has cost more than 6,000 people their lives. A ceasefire has been in place since February but the situation remains tenuous. 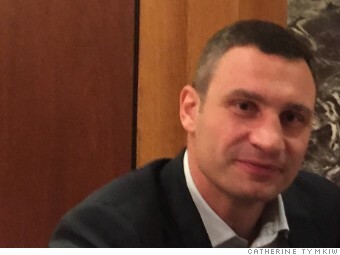 "This is a war without reason," Klitschko told CNNMoney. "This war was created not in Ukraine but outside of Ukraine from someone who had a dream to build big Russian empire. We don't want to go back to USSR." Ukraine still has a long way to go before it can claim to be stable. Inflation is at 46% and its currency, the hryvnia, has lost more than half its value over the past year. At the same time, Klitschko sees Kiev as the key to getting the country on solid footing. "We have to make changes in the country but all changes in the country have to start with Kiev, with the capital." Since taking office a year ago, Klitschko has improved government transparency by making city budgets and expenditures available online, and launched a "Smart Cities" program that includes reducing dependency on Russian gas through renewables and other energy efficient technologies. 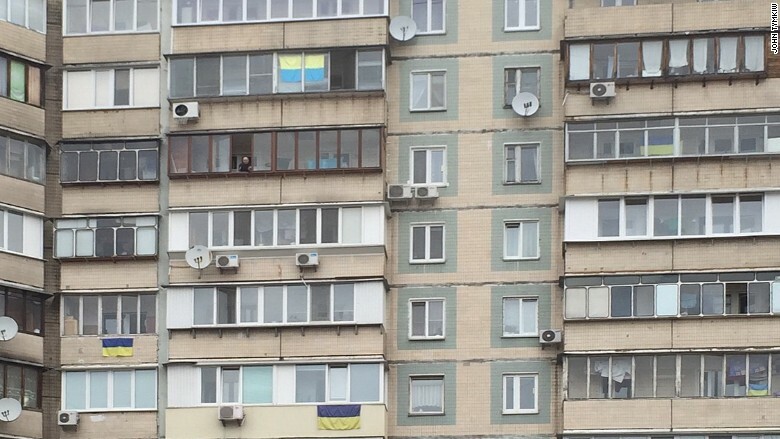 And if the mayor has his way, he hopes Kiev will be completely energy independent by next winter. To help drum up support for energy and infrastructure projects, he's helped launch the Kyiv Development Fund, which is still in its infancy but generating interest. But the real key to economic recovery? Investment. Without it, it will be very difficult for the economy to recover, he said. And that's a tough sell. "Right now, people are very skeptical about investing in Ukraine," Klitschko acknowledged, but that's also why he thinks now is "a time of opportunity." It's prime time for investors to get in at "under market prices," he said. Some hot spots for investors include IT, software development, engineering, aeronautics, pharmaceuticals and food processing. Samsung (SSNLF) and Aricent already have a presence. He pointed out that Ukraine's neighbors, like Poland, Hungary and the Czech Republic, have made huge progress. So why can't Ukraine? "We have to work without a monopoly and to give a chance for every investor to invest in Ukraine," said Klitschko. For example, Ukraine has 36% of the world's arable soil, yet "if you drive through the country, people don't live, they survive there," he said. The agricultural sector needs an overhaul. But that's not all. Ultimately for things to change, Klitschko thinks the country needs new economic rules that include giving small and mid-sized businesses a chance to develop. "It is our goal to do it as fast as possible." At the same time, instability in the east, high inflation, and low credit ratings can't be ignored. And Russia remains a wild card. "We can't predict Russia's politics regarding Ukraine and that's what we worry about very much," he said. "Our main goal is to bring peace. I'm more than sure we have to find a diplomatic decision for this conflict." Russia has already been slapped with big sanctions by the West for its support of the annexation of Crimea and the separatist rebels in eastern Ukraine. 'We talk about sanctions a pretty long time. Just after Malaysian Air tragedy, all European, many people in the world understand it's not a local conflict in Ukraine. It can touch everyone. If we're united together, we'll be much stronger." He said nearly 80% of Ukraine sees the country as a modern European democratic country. But it remains an uphill battle for now -- nothing new for the former heavyweight boxing champ. "I know better than anyone....no fight, no win...and that is why we are fighting for our values, for our future," Klitschko said.